Actors Sheila Gordon and Noah Karrasch, and director Dr. Robert Bradley. 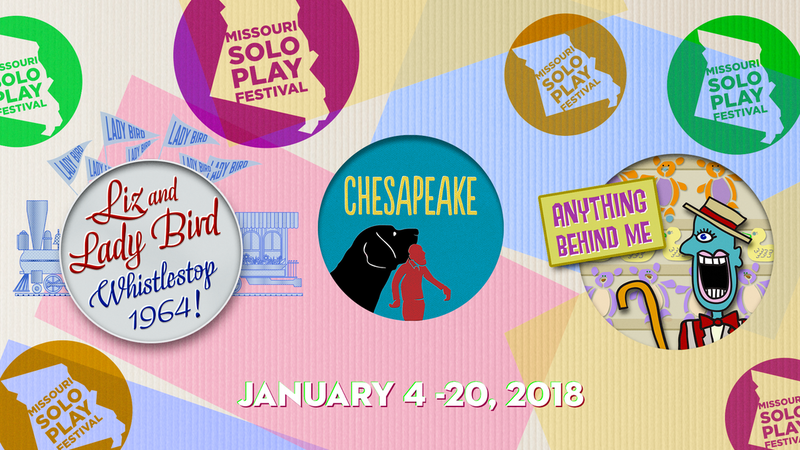 The 2019 Missouri Solo Play Festival runs January 4-20 at SCT Center Stage. Springfield Contemporary Theatre at SCT Center Stage in Wilhoit Plaza, corner of Pershing & Jefferson downtown, presents the annual "Missouri Solo Play Festival" January 4-20, with three great solo performers appearing in repertory. This is the third year of the festival, says Dr. Robert Bradley, who's directing the second show in the festival, "Chesapeake." You may remember four shows in the festival last year--but one of them was actually a solo dance performance by MSU's Ruth Barnes. This year it's back to three plays, period. Equity member Sheila Gordon wrote and will perform in the world premiere of "Liz and Ladybird: Whistlestop 1964" Jan.4, 5 and 11 at 7:30pm and Jan.6 and 12 at 2:00; the show is directed by Rebecca Whitehurst. In October 1964, on the eve of the Presidential election the following month, the Deep South was fiercely set against re-electing President Lyndon Baines Johnson, due to his role in the passage of the Civil Rights Act. LBJ's Texas origins wouldn't have been much help on a campaign trip through the Deep South anyway (never mind native Minnesotan, Vice President Hubert Humphrey!). Instead, the plan was hatched to send First Lady Claudia "Lady Bird" Johnson on a nearly 1700-mile whistle-stop trip through Southern towns to sell both LBJ's War on Poverty and Civil Rights agendas. For the first time in U.S. history, a First Lady would take to the campaign trail unaccompanied by her husband. One of the chief architects of the plan was Lady Bird's Press Secretary, Liz Carpenter. And playwright/actor Sheila Gordon tells the "Liz and Ladybird" story through Liz Carpenter's perspective. "She was the first female journalist to be appointed to that position," says Gordon. Like President Johnson, Carpenter was also from Texas. She and Lady Bird both attended University of Texas-Austin. But, adds Gordon, "Lady Bird had roots in the Deep South. Most of her family was from Alabama, and she had that more genteel kind of personality," she says, affecting a Southern drawl. How did Sheila Gordon choose this subject? "I have a history of creating solo shows, and I wanted to do something different"--as opposed to characters and subjects based in her own life. Gordon, while a Northerner, now lives in Austin, Texas. But she "had never heard of Liz Carpenter. I started reading about her and looking up interviews, and she was just this extraordinary, huge figure--funny, outgoing, and a feminist, and really would just challenge the status quo." Not only historic for being the first time a First Lady had gone on the campaign trail without the President, Gordon notes the Lady Bird Whistle-Stop campaign "was largely all-female organized. They would have local (male) politicians like Hale Boggs, people who were bigwigs in the Democratic Party, do stump speeches from the back of the caboose. But the organization of it was largely female-led. And that caused a lot of infighting and backstabbing within the White House itself. But it was historic." In addition to playing Liz Carpenter and Lady Bird Johnson, Gordon has set herself a formidable task in this play. "All in all," she says, she portrays "about 37 different characters, including all the press and everything"--and even LBJ himself. "So it's a lot of fun... and quite challenging!" Play number two in the 2019 Missouri Solo Play Festival is "Chesapeake" by Lee Blessing, directed by Robert Bradley and starring Noah Karrash. Dr. Bradley calls this the "outlier" among the three shows this year, in that "Liz and Lady Bird" is based on historical figures, and the third play, "Anything Behind Me," is an autobiographical script by actor Bryant Turnage. "Then here in the middle of these two is a funny, quirky little play." "Chesapeake", while fictional, also deals with politics, says actor Noah Karrasch. "There's so much in this play! Basically, this is a performance artist who rubs a Congressman the wrong way, starts to lose his Federal NEA (National Endowment for the Arts) grant, and decides to do a little revenge. And everything goes wrong from there. I won't describe what the second act is like, because it is so bizarre. But I also had to giggle a bit when Sheila (talked about playing) 37 characters--I was thinking, 'My gosh, I'm working my tail off with FIVE main characters...' and maybe ten in total. I'm feeling like a little bit of a slacker here!" The performance artist is also the play's narrator, says Karrasch, who also gets to play Congressman-turned Senator Senator Thurm Poolie, Poolie's wife, his assistant, and a few others as well. The "revenge" takes the form of the performance artist kidnapping the politician's dog and attempting to make the pooch loyal to him... that's the plan, anyway. It's the artist's one last fling with his NEA grant money. Bob Bradley adds that the politician, a conservative U.S. Representative who's running for (and wins) a Senate seat, strikes him as being remarkably close in personality and spirit to onetime 7th District Congressman Durward Hall (1910-2001). "Durward and Thurm Poolie would have just gotten along beautifully!" Bradley laughs. Noah Karrasch says the play deals with the issue of "fundamentalism and conservatism butting heads with art and freedom and various other things. It's a very interesting piece." Bradley calls "Chesapeake" "a play about art, politics, men, and dogs. You put all those together and you get Lee Blessing's 'Chesapeake.'" It's performed January 10, 12 and 18 all at 7:30pm, and January 13 and 19 both at 2:00pm. The third play in this year's Solo Play Festival is the world premiere of "Anything Behind Me," written and performed by Bryant Turnage and directed by David Rice. Dates are January 17 and 19 at 7:30 pm, and two performances on January 20, at 2:00 and 7:30pm. This humorous and touching play tells the story of Turnage as a young man who drops out of college to join a carnival, discovering that the exciting life on the road isn't as magical as he originally thought... and that sometimes, the best prizes are those just out of reach... sometimes. Tickets for the entire three-show package are $45; otherwise tickets per show are $20-$22, with $10 student rush. For tickets call 831-8001 or visit www.springfieldcontemporarytheatre.org.